Evgeni Malkin had quite a difficult time figuring out a rubik's cube Saturday afternoon before the Pens took the ice. It may have been the only difficulty he had all night. Malkin took the game into his own hands Saturday night, and contributed 3 goals and an assist en route to a 4-2 win over the Thrashers. It was Geno's 1st hattie of the season, and the first this season by a Penguin. Malkin's 1st goal of the night was an absolute dart aimed straight at Pavelec's 5 hole. Geno fired the game-tying laser after receiving a nice dish pass from Arron Asham. Then it was Malkin's turn to play the helper role when he dished a long pass across to Deryk Engelland, who threw it off Crosby's waiting stick and into the net. 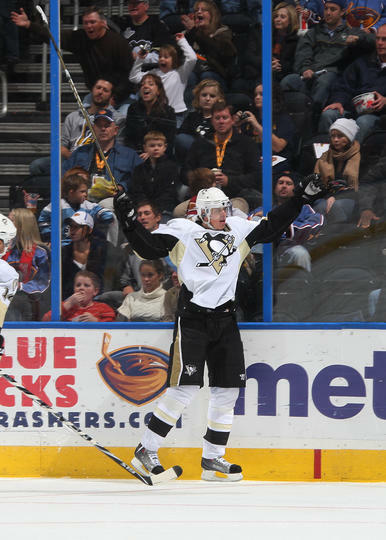 It was Sid's 12th goal of the season, and he also picked up 2 more assists to tie Stamkos for the points lead. While I'm sure Malkin was happy enough to celebrate with his teammates, he grabbed the glory again later in the third when he knocked a pass from Paul Martin out of mid-air, bounced it off the back boards, and then stuffed it past Pavelec to put the Pens up 3-1. Malkin completed the hat trick with an empty net put-away goal with about a minute remaining. It may have only been an empty netter but it still took some good hustle on Geno's part to beat the defender. While Malkin was lighting it up, his pal Fleury was ice cold back in the defensive zone. Fleury turned away 31 of 33 shots for his 2nd win in as many days and some more well-deserved praise. Fleury's 31 saves were all important, but none more than his absolute highway robbery on Burmistrov and Ben Eager with 4 minutes left in the game. Malkin's 2nd goal of the game turned out to be the difference maker, so therefore it has been chosen over the other 2. Offense: A- Not quite as good of an overall balanced and spirited performance by everyone like last night, but hey...When you have the superstar talent, use it. Defense: B+ Fleury saw 33 shots including some quality opportunities, but the Pens' defense was able to control the damage and eliminate 2nd and 3rd chances from Atlanta's initial opportunities. Fleury: A- Made some massive saves late to keep the Pens ahead. Can't blame him for the 1st goal he let in. Michalek, Adams, and Boulten were all standing right in front of him. As far as Bergfors's goal, I cannot explain it. Fleury's positioning was fine, he was squared up to the shot, and he got there in enough time. The puck just went through a hole that wasn't there. Powerplay: B Their 1st powerplay of the game may have been their worst of the season, but they recovered after that. Malkin's 2nd goal was on the powerplay. Penalty Kill: A Held Atlanta's red-hot PP to 0-5. The regulars like Adams, Talbot, and Cooke were out doing work like usual and did some fine work tonight. -As crazy as this sounds, sometimes it seems like Malkin's value to the team can be a bit under appreciated. Everyone recognizes his talent, but sometimes it seems like he gets grouped as Crosby's "sidekick." It's games like this one that make you sit back and wonder where the team would be without the 2nd head of the 2-headed monster. -Craig Adams has been awesome these last few games. He will probably get no recognition for his efforts by the mainstream media, but his PK work and just the toughness and energy he brings to the table was a driving force for both games this weekend. Therefore, he gets a shoutout from me. -Pens have officially made it back over the .500 mark. (9-8-1) Hopefully it will be behind them for the rest of the season. I think the problem with Malkin is the fact that he completely disappears for stretches of time. When he isn't playing great he can be downright awful and he becomes a turnover machine.